All the players on the list are running backs except Denard Robinson, Rick Leach, Devin Gardner, and Steve Smith. That 1976 season must have been a heckuva year, considering Lytle (14) and Huckleby (11) are both in the top 30 all-time. 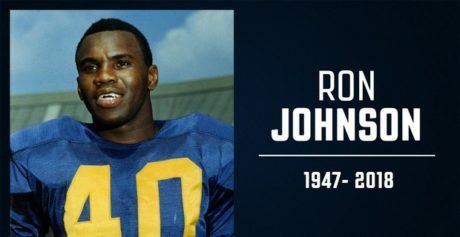 I give Ron Johnson a big place in history as both an athlete and as UM’s first black captain, but only know of his work through highlights in that I really didn’t start following UM football until Bo in 1969. I bothers me that people don’t give the A-Train the credit he deserves. He played on some well balanced teams and with some great OL blocking but Coach Carr used him as his go to throughout Thomas’ career. If you didn’t get the opportunity to see Biakabutuka, Wheatley, or Butch Woolfolk play you missed the anticipation that on any given play they could go all the way. During Michigan’s very dark ages we had Denard Robinson. Along with AC the two players that most make me think of lightning in a bottle.